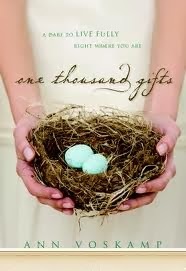 a book chick: "One Thousand Gifts"
my take: It took me two tries to read this. The first attempt was to read jointly with one of my Harbor House ladies. One chapter and I knew this wasn't going to be a good fit … and then she kind of disappeared so I set the book aside. After it was suggested by a new friend, I dug it out and got a little down: pure jealousy. How can this woman make every sentence beautiful? I know, I know, such beautiful writing should be inspiring, uplifting. I got over it and am so glad I did. The author was challenged by a friend to name one thousand different "gifts" - moments - as a gratitude practice. What's inspiring is that Ann Voskamp, although a kind of wonder woman, is vulnerable and feels unworthy and struggles with pain and fear AND finds a way to celebrate these small, precious, ordinary presents (and presence). I've since brought the challenge to my Harbor House ladies during a life skills class on gratitude. Are you up for the challenge?